There are few certainties in this life. Death and taxes, for sure. But the one certainty that has many investors worried right now is the old cliché: What goes up must come down. All bull markets eventually end. I’m not saying the current bull run is at an end, but said ending is an eventual certainty. The best that we can do as investors is to diversify, hold a little gold and try to shift our holdings to line up with the current market conditions. That last point is not always easy to do. For example, how do you combat the potential fallout from a global trade war? President Donald Trump has threatened billions in tariffs in addition to those already implemented on steel and aluminum imports. How does an investor deal with the potential retaliatory effects of “America First” protectionist economic policies? The best place to start, in my opinion, is by reading The Bauman Letter. Ted Bauman has long had his eye on the situation, and offers up actionable solutions to both grow and protect your wealth. In my article last week, I offered up an investing opportunity in the oil sector based off Ted’s market outlook in the April edition of The Bauman Letter. The point is that while the bull market won’t last forever, there are sectors and stocks that will hold up and even grow your investments in such uncertain times … even in the event of a trade war. This week, I’m going to highlight another investing opportunity based on Ted’s market outlook. It focuses on a tech company that rests in a sweet spot that I believe is an often overlooked certainty in today’s market: American software dominance. From work productivity to entertainment, from graphic design to database management, the world runs on American software. Walk into any home or business in the world with a computer, and you will find American software. Microsoft’s Windows operating system is just as ubiquitous as it was nearly 30 years ago during the tech boom of the 1990s. Google Chrome is the web browser of choice for a vast majority of online interactions. And the video game software world is dominated by the likes of Electronic Arts and Activision Blizzard. It’s the new “certainty” for the digital age. What’s more, the software market is easily among the most protected from the fallout of an international trade war. After all, if you want to invest in U.S. sectors insulated from a trade war, you need to find those industries that foreigners can’t do without. And U.S. software is the world’s operating system. Because of this, it is very unlikely that foreign governments would slap tariffs on these American products, as it would immediately increase prices for almost every sector of their own economies, including government. It’s one of the tenants that Ted lays out in the April edition of The Bauman Letter. With this in mind, the question becomes where in the U.S. software sector to invest? Adobe Systems Inc. (Nasdaq: ADBE) needs no introduction. Adobe Acrobat software is the premier reader for the company’s extremely popular PDF document format. (The Bauman Letter and many other Banyan Hill publications are delivered each month electronically via PDF.) Adobe Creative Suite is among the most popular sets of desktop publication software on the market. And Photoshop has become so universally used, it has become the de facto verb for image and photo alterations. Adobe made the leap into cloud services about two years ago, and it has juiced earnings considerably. The company now regularly sees 21% revenue growth on a quarter-over-quarter basis and is expected to hold that growth rate through the next five years. But those projections could be thrown out the window if Adobe’s newest venture plays out. The company recently announced Adobe Sensei, an artificial intelligence (AI) project centered on marketing and ad-targeting strategies. What’s more, Adobe is partnering with AI giant Nvidia to make Sensei a success. The project’s main focus is digesting background details from brands, including a customer’s age, location, lifestyle, internet browsing habits and shopping patterns. Sensei then takes all that data and spits out recommendations on the best method for targeting that customer, including the best medium for communication. The potential for product marketing and ad-targeting is huge, and could add significantly to Adobe’s bottom line. Getting into the nitty-gritty on Adobe stock, sentiment price action has been more than encouraging. ADBE stock is in a long-term uptrend, driven by the company’s solid fundamentals. The shares have rallied more than 67% in the past year, rising trend line support loosely defined by their 50-day moving average. Adobe stock hit an all-time high near $230 last month, and has held up remarkably well amid rising volatility in the broader market. The recent pullback in ADBE stock is an excellent entry point for those looking to add shares to their portfolios. 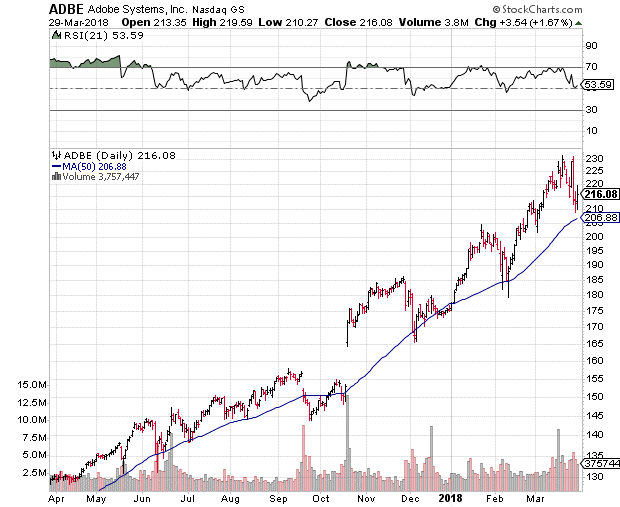 ADBE is far from overbought despite its strong price action, and support is holding firm in the $210 region — currently home to Adobe’s 50-day trend line. ADBE stock is a buy in the $210 to $220 range. With Adobe now integrating AI into its offering of cloud services, an upside price target of $300 is not out of the question. Traders buying into ADBE should consider a stop-loss on a daily close below $200, as this could be an indication that sentiment has shifted bearish on the shares. Editor’s Note: You’ve probably seen the recent headlines about the latest cyberattacks. Boeing was hit by a ransomware virus. Under Armour reported that data for 150 million customers was stolen. The list goes on and on. That’s why the cybersecurity sector is projected to balloon to a $1 trillion industry in the next several years … giving early investors who buy the right cybersecurity stocks the chance to make extraordinary gains. To learn more about this incredible, once-in-a-lifetime opportunity, click here now.